One makeup trend is a pretty pink blush halo around the eyes. It's the perfect mix of lovely and sweet, and edgy and fun. This simple how-to will have you creating the look in minutes and have all eyes pointing in the right direction — to you! Pretty summer makeup makes us blush, but this time we're blushing around the eyes! A soft pink blush application around the eyes — sometimes called a blush halo — makes for lovely summer eyes. Create this look in minutes for your next daytime beach outing or summer date night! Pick a pretty pink blush. The color you regularly use works perfectly, but feel free to experiment with darker or brighter shades. We love Boots No7 Natural Blush (Target, $9), Luminous Mineral Blush Duo (Victoria's Secret, $15) and NARS Powder Blush (Sephora, $29). Start by applying your regular base makeup. This could be a clear face or foundation and lipgloss. But no blush — we're moving the pretty pink glow from your cheeks to your eyes. This style looks pretty accented with black. If you'd like, line your eyes lightly with black eyeliner and coat your top and bottom eyelashes with one layer of black mascara. Now you're ready to halo your eyes! Load your blush brush with more blush than you'd usually use. 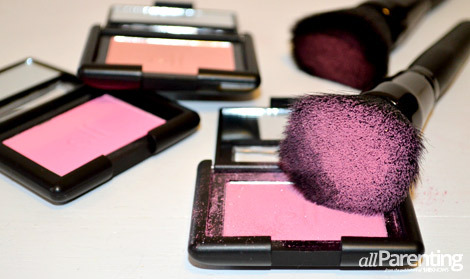 Planting the brush straight down into the blush, dip several times until the color looks bold. Pat the blush under and around your eye. Start where you'd put undereye concealer, move to the edge of your eye right above your cheek bone, then move along the eyelid, filling in beneath your eyebrow. Repeat a second time if you'd like a darker, bolder look, and then follow the same steps on your other eye. Now you're officially pretty in pink! Best lipglosses to try out!